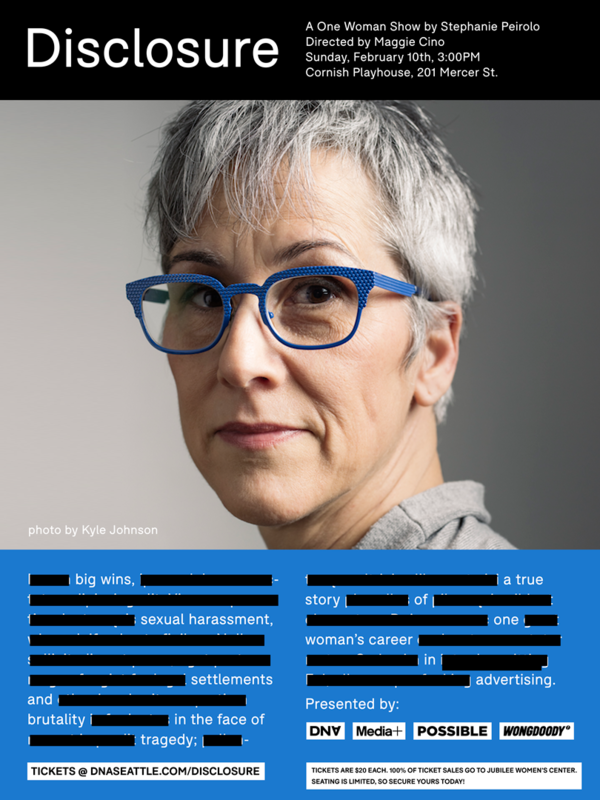 Our founder and CEO, Alan Brown, weighed in for The Drum about Disclosure (a one-woman show) and how men need to take a stand and support women in advertising. Below are the following thoughts that were published on The Drum on February 5, 2019. I’m calling on my fellow chief execs, agency leaders, creative directors, and men of all levels in our industry to take a stand and support women in advertising. We all need to acknowledge the slights, the missed promotions, pay inequality, and the sexual harassment that continues in the workplace. And we need to fix it. The men in the ad industry need to step up and really put ourselves in women’s shoes. No doubt there are many who already do this in many ways. But until we are able to truly understand the challenges women in our industry face on a daily basis, we can not bring change to a system that is flawed and still broken. It’s not just women in entry-level roles or in the creative departments. Even women in the C-suite are challenged in ways that men in similar roles are not. While I’ve experienced some of the sideways glances and direct discrimination as a gay man in advertising, there’s no doubt in my mind that what women are put through is a different kind of assault. We can intellectualize the issues of sexism and other forms of discrimination, but we need to go beyond nodding our heads that the issue exists, to taking action. What also struck me about Stephanie’s story is the realization that she is not alone. She is one of a growing chorus of voices that are coming forward to bring an end to women ever having to say #metoo again. And having to sign disclosure documents that prevent them from telling their stories. While I can’t make up for all the wrongs Stephanie and other women like her have experienced, I can help her voice be heard. With the partnership of three other agencies in Seattle all led by women chief execs— Possible, WongDoody, and MediaPlus — we are bringing Stephanie to the stage for a special charity performance for our agencies and the public on 10 February in Seattle. With our community united behind Stephanie and her message, it has the feeling of a movement. A start to bringing greater awareness and understanding. We need to ask ourselves what we can do to support women in our agencies and our business. They need to feel that advertising is a place for them. Women are already leaving the industry. I know firsthand because I spent a year trying to hire a female creative director and while we got close, our top choices opted for other industries or to remain freelance. We can all find ways to show support. We can all listen. We can mentor. And we can, in turn, be mentored to become better men and leaders. Our industry needs us to step up.